GAINWELL - Fun for any age. 4. Rejuvenates and nourishes the body with lush aromatherapy that smoothens the skin and leaves a feel-good result, experience all the pleasures of a SPA treatment directly from home. 5. Bath bombs that won't stain your tub - benefit from a product that's entirely natural and contains no artificial flavors or colors.
. Money Back Guarantee. Package content 6 x 5oz bath bombs xl size, egg shape dreamsicle 1 piece （orange，orange scent） gummy bear 1 piece （green，forest scent） galaxy 1 Piece （Blue，ocean scent） Bubble Gum 1 Piece （Red，strawberry scent） Cotton Candy 1 Piece （purple，Amomum tsao-ko scent） Fruits soda 1 Piece （Pink，grapefruit scent） Specification Size: 19cm x17cm x6. 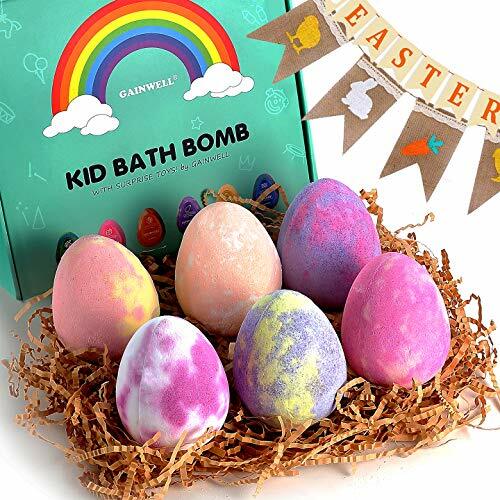 GAINWELL Easter Hatchimal KIDS Bath Bomb Gift Set –XL SIZE（6 x 5 Oz – Handmade Essential Oil Spa Galaxy Bomb Fizzies with Hand Painted Wooden Toys– for Relaxation, Moisturizing and Fun for All Ages - 5cm 13. 4"x6. 2"x2. 7" weight:840g 30 oz. Note while our children's variety is completely safe, please note that the toy in the middle poses a choking hazard for kids under three. Gainwell bath bomb 6-piece gift set includes 6 unique scents: bubble gum, Dreamsicle, Cotton Candy, Galaxy, Grape Soda and Gummy Bears. Each are large size of a tennis ball which is larger than most of our competitors. Each bath bomb contain clay combined with mineral salts, shea and cocoa butters, sunflower seed oil, baking soda and fragrance to fizz aches and dry skin away.3. I am Happy - Enhance bath time fun for your 3, 5, 4, 6 or 7 year old with this educational sensory learning bath experience! Get 6 lush bath bombs with toys inside that smell great and create a great fizz for your girl or boy. Perfect birthday gift or holiday gifting idea for toddlers and children 3, 5, 6, 4, and 7 years of age. Simple ingredients you can pronounce: baking Soda, Natural Butters, Corn Starch, Fragrance and Coloring. Create excitement and anticipation for your kids with no tub residue for you to clean-up. We purposely made all bathbombs light in color so that it does not stain your kids skin or the tub. No surprises with a compostable and recyclable box and filling. Kids Bath Bombs with Surprise Inside: Sea Animal Toys Inside, Great Gift Set for Boys and Girls, Safe Ingredients that Don’t Stain the Tub - Your tub water will turn a light shade of color, but will be easy to clean. Educational toy: indulge your child in sensory learning important for your kids cognitive development. Color residue is no fun and more pain than it is worth! smells great and good fizz - 6 colorful and unique luxury scents your kid will love including Purple Unicorn, Strawberry Rose, Sky Galaxy, Mermaid Fizz, Orange Amaze, and LOL Sunshine. No tantrums policy: sea animal toys inside every Kid Bath Bomb. We guarantee the fizzy suprise in each bathbomb or you will receive a new gift set. No tub stains: fun colors that do not leave a ring around your tub. I am Happy - Create excitement and anticipation for your kids with no tub residue for you to clean-up. We purposely made all bathbombs light in color so that it does not stain your kids skin or the tub. No tantrums policy! get a toy prize inside every bath bomb or we will replace the whole set guaranteed! we know how important it is that each bath bomb has a surprise inside and the disappointment it creates when one sister has a toy and the brother does not! Each bath bomb set comes with 6 5 oz cute bath bombs in six assorted colored fizzies and organic essential oils handmade in the USA with gender neutral sea animal toys inside. Teach your kids the names of different sea creatures while they enjoy their bubble bath. Perfect birthday gift or holiday gifting idea for toddlers and children 3, 6, 5, 4, and 7 years of age. Simple ingredients you can pronounce: baking Soda, Natural Butters, Corn Starch, Fragrance and Coloring. Your tub water will turn a light shade of color, but will be easy to clean. Kids Bath Bombs with Surprise Inside: Farm Animal Toys Inside, Great Gift Set for Boys and Girls, Safe Ingredients that Don’t Stain the Tub - Educational toy: indulge your child in sensory learning important for your kids cognitive development. No surprises with a compostable and recyclable box and filling. Enhance bath time fun for your 3, 4, 5, 6 or 7 year old with this educational sensory learning bath experience! Get 6 lush bath bombs with toys inside that smell great and create a great fizz for your girl or boy. Perfect birthday gift or holiday gifting idea for toddlers and children 3, 6, 4, 5, and 7 years of age. Simple ingredients you can pronounce: baking Soda, Corn Starch, Natural Butters, Fragrance and Coloring. Huizhou Yianni Cosmetic Ltd. Bath Bombs 12 Set - Your tub water will turn a light shade of color, but will be easy to clean. Educational toy: indulge your child in sensory learning important for your kids cognitive development. 12 uniquely crafted aroma: mint -- clear mood, lemon -- a good heart, strawberry -- feeling good, lavander -- unwind mind, ocean -- Lush Life, Violet -- Remove Tiredness, Rose -- Sweet Dreams, Vanilla -- Refresh Brain, Chamomile -- Missing Breath, Green-tea -- Good Day, Green-apple -- soothe muscles, Eucalyptus -- Enjoy Every Day. No surprises with a compostable and recyclable box and filling. Surprise toys inside: each of our bath bombs for kids has surprise toy in it, watch for which toys inside after fizzing. 12 moisturizing essential oil bath bombs set for kids with surprise toys inside - Lush Bath Bombs with Surprise Toy Inside - 12 uniquely designed gift within a gift bath bombs, each of our bath bombs for kids with different surprise toys in it - Each about 3. Kids Bath Bombs with Surprise Toys Inside - Lush Bubble Bath Fizzies Natural Vegan Essential Oil Spa Bath Fizz Balls Kit for Girls/Boys/Women Dry Skin Moisturize, Handmade 12 Gift Set, Kid Safe - 2 oz, 2 inches in diameter. Fun colors that do not leave a oil ring around your tub. Our surprise bubble bath bombs are a gift within a gift - when the bath bomb fizzes out, they have a fun toy to remember what is sure to be one of their favorite gifts. The finest natural and organic ingredients: our bath toys bombs use organic scented essential Oils, Sodium Bicarbonate Baking Soda, Water, Epsom salt, Natural Clays, Citric Acid, Certified Organic Sustainable Palm Oil, ensure that they are KID Safe, Coconut Oil, Butyrospermum Parkii Virgin Shea & coco Butter, leave your skin hydrated and moisturized. 100% natural bath bombs that no tub stains: this gift set contains 12 uniquely crafted aroma: mint, Ocean, Vanilla, Strawberry, Violet, Lemon, Eucalyptus. Perfect birthday gift or holiday gifting idea for toddlers and children 3, 6, 5, 4, and 7 years of age. Sky Organics - Warning: chocking hazard-not for children under the age of 3 Six Assorted Scents: Bubble Gum :- Sweet & juicy childhood bubblegum pink and white Cotton Candy: Fabulous aroma of freshly spun cotton candy. Our surprise bubble bath bombs are a gift within a gift - when the bath bomb fizzes out, they have a fun toy to remember what is sure to be one of their favorite gifts. The finest natural and organic ingredients: our bath toys bombs use organic scented essential Oils, Natural Clays, Butyrospermum Parkii Virgin Shea & coco Butter, ensure that they are KID Safe, Sodium Bicarbonate Baking Soda, Coconut Oil, Epsom salt, Certified Organic Sustainable Palm Oil, Citric Acid, Water, leave your skin hydrated and moisturized. Kids Bath Bombs Gift Set with Surprise Toys, 6x5oz Fun Assorted Colored XL Bath Fizzies, Kid Safe, Gender Neutral with Organic Essential Oils -Handmade in the USA Organic Bubble Bath Fizzy Pack of 1 - 100% natural bath bombs that no tub stains: this gift set contains 12 uniquely crafted aroma: mint, Lemon, Vanilla, Ocean, Strawberry, Violet, Eucalyptus. Settle in for a wonderful immersion with an original Sky Organics invention, exploding with organic essential oils, invigorating multilayered explosion of color and scent. They are the size of a tennis ball which is larger than most of our competitors. Currently feauturing gender neutral "Pokemon" Toys. Your tub water will turn a light shade of color, Green-tea, Lavander, Chamomile, Green-apple, Rose, but will be easy to clean. Turns you into the hero of bath time: tired of fighting with your kids to get them to take a bath? Our big bath fizz bombs transform you from the villain to hero of bubble bath time. sela beauty - 100% natural bath bombs that won't stain your tub - benefit from a product that's entirely natural and contains no artificial flavors or colors. Smells great and good fizz -2 colorful and unique luxury scents your kid will love including Purple Unicorn, Orange Amaze, Mermaid Fizz, Strawberry Rose, Sky Galaxy, and LOL Sunshine. With 6 surprise luminous tree Elves Doll Elfin Aliens Home Garden Indoor Outdoor Ornament. Your tub water will turn a light shade of color, but will be easy to clean. Educational toy: indulge your child in sensory learning important for your kids cognitive development. The natural bath bombs smell like lemon, cocoa, cherry, lavender, jasmine and oatmeal. easter eggs with toys inside Kids Bath Bombs with elves Inside: egg shaped bathbombs with christmas tree elf 6 X 6.4 OZ each Great Gift Set for Boys and Girls, Safe for kids by Bubblimals - Perfect birthday gift or holiday gifting idea for toddlers and children 3, 6, 5, 4, and 7 years of age. Simple ingredients you can pronounce: baking Soda, Natural Butters, Corn Starch, Fragrance and Coloring. Fun for any age. Hand-crafted with love in the usa- all of our ultra lush bath bombs are unique creations made by hand in the USA. Perfect bubble bath gift set for Surprise, Anniversaries, Birthday gift, Spa/Bath gifts, men. This gift set contains these 6 amazing scents: Bubble Gum, Dreamsicle, Cotton Candy, Galaxy, Grape Soda and Gummy Bears. Naknikos Inc. - Settle in for a wonderful immersion with an original Sky Organics invention, exploding with organic essential oils, invigorating multilayered explosion of color and scent. Sponge toy inside and not a hard plastic - will never hurt your child like hard plastic toys do. The bean people bath Sprudel is a bath bomb for kids with a surprise toy in side. Also, sky galaxy, orange amaze, learn first-hand about color mixing by putting 2 primary colored Sprudels in your bath at the same time! Smells great and good fizz - 6 colorful and unique luxury scents your kid will love including Purple Unicorn, Mermaid Fizz, Strawberry Rose, and LOL Sunshine. No tantrums policy: sea animal toys inside every Kid Bath Bomb. BATH SPRUDELS. Bath bombs for kids with surprise toy. Gift Set of 6. Bath bombs with food grade ingredients with surprise sponge toys inside for Boys and Girls. For 3+ years old kids. En&Fr package - Fun for any age. Good for 6 individual baths, if used one at a time. They smell delicious and refreshing without being overwhelming. Nourishing formula: the bath fizzies were specially formulated for your kid's sensitive skin so they can be nourishing and absolutely safe. We guarantee the fizzy suprise in each bathbomb or you will receive a new gift set. No tub stains: fun colors that do not leave a ring around your tub. Beautiful scents: the 5 bath fizzy bombs come in a variety of colors and scents to make each bath unique and exciting for your little one. Beauty-Soaps Commodity Corporation LTD - Our surprise bubble bath bombs are a gift within a gift - when the bath bomb fizzes out, they have a fun toy to remember what is sure to be one of their favorite gifts. The finest natural and organic ingredients: our bath toys bombs use organic scented essential Oils, Butyrospermum Parkii Virgin Shea & coco Butter, Epsom salt, Sodium Bicarbonate Baking Soda, Natural Clays, ensure that they are KID Safe, Citric Acid, Water, Coconut Oil, Certified Organic Sustainable Palm Oil, leave your skin hydrated and moisturized. 100% natural bath bombs that no tub stains: this gift set contains 12 uniquely crafted aroma: mint, Ocean, Vanilla, Lemon, Violet, Strawberry, Eucalyptus. Your tub water will turn a light shade of color, but will be easy to clean. Educational toy: indulge your child in sensory learning important for your kids cognitive development. Bath Bombs for Kids with Toys Inside 8 Packs, Natural Bath Fizzers with Suprises for Girls Boys, Mild and Gentle,Great Gift Ideas for Birthday Christmas - The scent is subtle and doesn't leave any residue on the skin or in the tub. Toys vary from pack to pack. They each contain a gender neutral surprise toy that gets revealed when they fizz out! Pokemon at the moment. Smells great and good fizz -2 colorful and unique luxury scents your kid will love including Purple Unicorn, Strawberry Rose, Sky Galaxy, Orange Amaze, Mermaid Fizz, and LOL Sunshine. With 6 surprise luminous tree Elves Doll Elfin Aliens Home Garden Indoor Outdoor Ornament. Two Sisters Spa - 6 fruity cherry and berry scents ❤ see and feel the difference of our Bubble BombsNo more fighting at Bath Time! Bathtime has never been so much fun and exciting. Our bath bombs change kiddos from saying "no way" to "every day" forbath time. Actually creates a bubble Bath! Our proprietary recipe was designed for bath bomb fans that also love a bubble bath. Fun fact! most other bath bombs don't create a bubble bathBest Surprises. Compare our variety to others and see the difference. Large Size. Each bubble Bomb is about 5 oz 2. 5 inches in diameter - almost the size of a tennis ball. Fun pirate minifigure Surprise is hidden in each bath bomb. The bath bombs for kids contain organic essential oils and Epsom salt that will deeply nourish, moisturize and hydrate your child's skin. Smells great and good fizz - 6 colorful and unique luxury scents your kid will love including Purple Unicorn, Strawberry Rose, Mermaid Fizz, Orange Amaze, Sky Galaxy, and LOL Sunshine. No tantrums policy: sea animal toys inside every Kid Bath Bomb. They are the size of a tennis ball which is larger than most of our competitors. Kids Pirate BUBBLE Bath Bombs with Surprise Toy Minifigures Inside by Two Sisters Spa. Set of 6 Large Fizzies in Gift Box. Safe, Fun Colors, Scented, Hand-made in the USA - Fda approved ingredients: aromacare Bath Bombs for Kids are made with FDA approved ingredients, which are safe and mild to children's delicate skin. A must have for grandparents and parents: fancy gift box and sturdy package, a perfect gift to kids for any moment; Just get rewarded yourself for an hour of free time when kids have fun and get clean. Two Sisters Spa - Did you see that? : every toddler loves a surprise. Your tub water will turn a light shade of color, but will be easy to clean. Educational toy: indulge your child in sensory learning important for your kids cognitive development. Toys vary from pack to pack. 100% satisfaction guarantee- toys inside every kids bath bomb. Our surprise bubble bath bombs are a gift within a gift - when the bath bomb fizzes out, Birthdays, Halloween, they have a fun piece of jewelry or toy to remember what is sure to be one of their favorite gifts. Money Back Guarantee. Our bath bombs offer a relaxing, that is. Our surprise bubble bath bombs are a gift within a gift - when the bath bomb fizzes out, they have a fun toy to remember what is sure to be one of their favorite gifts. The finest natural and organic ingredients: our bath toys bombs use organic scented essential Oils, Coconut Oil, Sodium Bicarbonate Baking Soda, ensure that they are KID Safe, Water, Citric Acid, Natural Clays, Epsom salt, Butyrospermum Parkii Virgin Shea & coco Butter, Certified Organic Sustainable Palm Oil, leave your skin hydrated and moisturized. Kids BUBBLE Bath Bombs with Surprise Toys Inside. Gender Neutral for Boys or Girls by Two Sisters Spa. Set of 6 Large Fizzies in Gift Box. Safe, Fun Colors, Scented, Hand-made in the USA - 100% natural bath bombs that no tub stains: this gift set contains 12 uniquely crafted aroma: mint, Vanilla, Ocean, Lemon, Strawberry, Violet, Eucalyptus. You will love how your kiddo smells after each bath. Vibrantly colorful Water that won't stain your tub. The most hydrating to moisturize dry sensitive skin. Spa Girl/Spa Pure 6ADOPT - Perfect gift - need a gift for a child or teen who "has everything?" we've got you covered. Fun colors that do not leave a oil ring around your tub. Your tub water will turn a light shade of color, but will be easy to clean. Great for Christmas, or any other Holiday. Fun party favor: be the "hero" of your child's birthday party - kids will love their pirate bath bombs as their mementos from your Pirate Party. What our customers are say about our bath bombs: "Love, Love! ", "completely surpassed our expectations", "A gift within a gift", Love, "Worth the price". Surprise toys inside - each of our bath bombs for Kids has a fun surprise inside - watch for wind-up toys, backpack clips/keychains, mini-figures, sticky hands, rubber ducks, bubbles, and more!. ADOPT-A-PUPPY BATH BOMBS for kids with 6 ADORABLE XL bath bombs with surprise puppy inside, USA Made, Handmade, Natural Bath Bombs, Birthday Gift idea for Kids, Spa Parties - Luxurious bubble bath - Ever wish your bath bomb created a bubble bath? Our original propriety formula does. Colorful scented water - Each bath bomb colors the water and fills the room with it's fruity fragrance. Perfect gift - need a gift for a child who "has everything?" we've got you covered. The bath bombs for kids contain organic essential oils and Epsom salt that will deeply nourish, moisturize and hydrate your child's skin. No surprises with a compostable and recyclable box and filling. Surprise toys inside: each of our bath bombs for kids has surprise toy in it, watch for which toys inside after fizzing. Perfect birthday gift or holiday gifting idea for toddlers and children 3, 4, 5, 6, and 7 years of age.